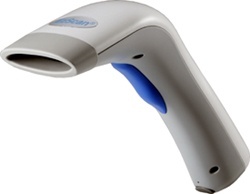 The BS-633 Barcode Scanner features durable construction. The BS-633 is a safe wireless communication via Bluetooth Class 1 V2.0 technology. The unit decodes most barcode types in use today. The wireless range is up to 100 meters and can support up to 4 scanners. The visible red light source enables the Scanner to read codes printed in colors as well as black. This makes the unit ideal for Point of Sale applications.